Watching the official movie as part of the series in its correct chronological position (between "The Illusion of Truth" and "Atonement") just feels jarring. It needs the proper season 4 opening credits! 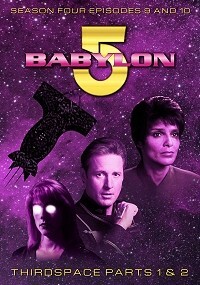 Babylon 5 Season 4 DVDs; the Thirdspace soundtrack album. Added: season 4 opening credits for part one and two, and the series music over the closing credits for both parts. This is a great Babylon 5 double episode! The break from Part 1 to Part 2 is so perfect that it looks like JMS intended this as a double episode but repurposed it when he needed several movies in a hurry for TNT before they started broadcasting Season 5. Another clear improvement is that the opening and closing narration are gone. They're another example that feels like JMS padded out a double-episode story to reach the requested runtime for a movie. I had to rewatch the original to find when Vir talks to Ivanova in the elevator. I didn't miss it in the edit. It was a superfluous scene anyway: Ivanova didn't need Vir's talk to figure out that the artifact is causing trouble on the station. I did miss Bill's breakfast where the possessed crowd tells him to work faster. But that's because I'm a fan of Clyde Kusatsu! Cutting this scene does change one detail: when Trent kills him, it now looks more her motivation and less obviously the artifact's motivation. That's not better or worse, just less obvious it's the artifact pushing her to do this. The only transitions that caught my ear were Part 1's transitions into the Opening and Closing Credits. But these transitions aren't perfect in all the original episodes either. So this imperfection is unfortunate but consistent with the series. I did not notice the other trims. Seamless work! Go. Watch this. You'll find yourself wanting to watch more B5 afterwards. One qualifier: My '8' for the AV Quality is the fault of the source material, not the edit. Babylon 5 is a gem in the sci-fi world, so it can only do the show a world of good to have a few entries on this site, it helps bring in curious devotees and fresh fans. This two part edit of one of the TV Movies is well worth a watch. It is edited in a very professional way, you'd think someone from the tv show actually worked on it. The attention-to-detail really shows in the use of the same font and presentation for on-screen credits, and the use of the series soundtrack fits soundly with scenes. If you ever feel like you need to sandwich something in between your binging of the fourth season, you can't get much better than this for an authentic B5 experience .